Applications are rapidly moving to the cloud. But the legacy architectures upon which we’ve relied for decades cannot adapt for a cloud-first strategy. Backhauling your branch office traffic over MPLS is expensive and inefficient—and users hate it. Enterprises are turning to SD-WAN to establish local internet breakouts. The challenge lies in how you secure them. – SD-WAN makes local internet breakouts easy. Zscaler makes them secure. 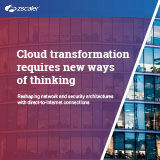 This solution brief describes how Barracuda CloudGen Firewalls help to solve issues with enterprise wide area networks.